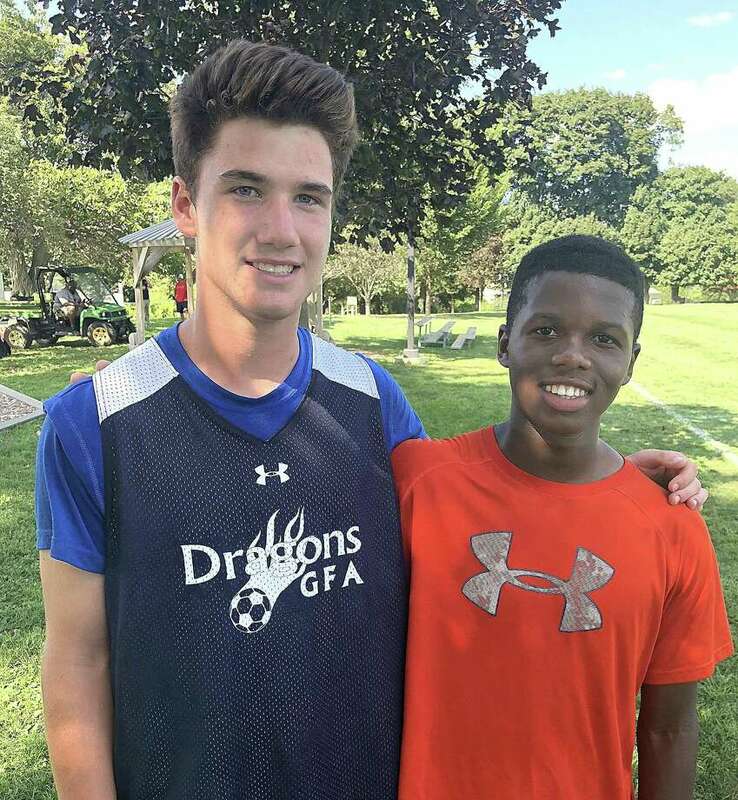 Greens Farms Academy’s Aidan Murphy, a sophomore soccer player, stands with Republic of Malawi native Zobran Elias, an exchange student at Indian Mountain School in Lakeville, following a recent soccer practice in Westport. Murphy went to Malawi for a soccer journey and Elias will be living in Darien with the Murphy family during the upcoming school year. WESTPORT — When Aidan Murphy’s parents first brought up the idea of his spending part of his summer in Africa, he was admittedly hesitant. After all, it’s a long way for a 16-year-old to travel without his friends and family, even if it meant taking part in the soccer experience of a lifetime. What Murphy experienced was three weeks in the Republic of Malawi, where he became part of the Chigoli Football Academy. “It was pretty amazing,” Murphy said. On weekends, Murphy got to play for Chigoli Academy, but during the week he and other members of the trip, which was sponsored by a company called Woza Soccer, would visit villages surrounding Lilongwe, the country’s capital, to teach soccer to younger children. The people, Murphy said, are what made the trip so incredible. While few spoke English, Murphy said they shared one common language: That of the sport of soccer. In early 2018, a family friend had mentioned Woza Soccer to the Murphys, planting the seed for the journey. Murphy could have gone to Peru or Costa Rica, but the family opted for Malawi. “The organizers at Woza Soccer said the level of soccer would be higher in Malawi than the other trips,” said Tom Murphy, Aidan’s father. It also taught Aidan Murphy a powerful, life-affirming message. “It just made me think about how grateful I am about the things I have, how blessed I am with the opportunities I have,” he said. Murphy not only brought back life-changing memories of his trip, but a new friend, as well. Zobran Elias, a member of the Chigoli Academy, received a full academic scholarship to attend the K-9 Indian Mountain School in Lakeville. What he didn’t have was a U.S. family to host him. At least not until fate brought Aidan Murphy to Malawi. Elias is now an official member of the Murphy household, which includes Ella, a GFA senior and girls soccer/lacrosse standout; freshman Patrick, a ninth-grader; and Gavin, a fifth-grader. He got to spend some time on the GFA campus during the soccer preseason, and had a chance to chat with Dragon Nation. Murphy might have felt a little trepidation about going off to a faraway land, but his embracing the opportunity has now changed two lives. And that’s a pretty special summer to remember.